sides of crushing cavity are lined with corundum ceramic liners, and the body and parts are all made of SUS304 stainless steel. All of these have improved the equipment's abrasion resistance and have absolutely zero pollution to material being crushed. 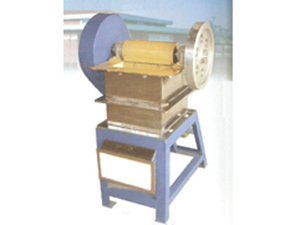 The entire machine is of good appearance, and can be used as a coarse crusher before a jet pulverizer. movable jaw and left and right board) is squeezed, split and bended to break. And the crushed material is discharged from the material outlet at the moment when the lower part of the movable jaw moves away from the fixed jaw. This machine features of simple structure, convenient maintenance, safe and reliable work performance, and wide application scope.